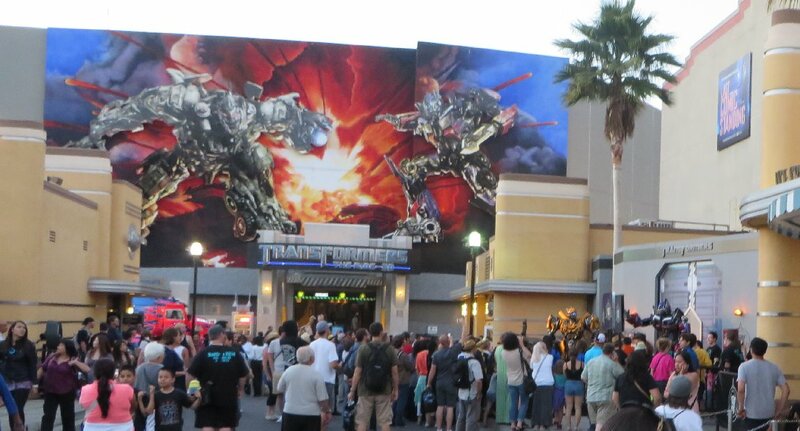 The first of two Transformers events was on at 9pm, so I had less than an hour to get down to the Transformers Ride in the Lower Lot, and back again. 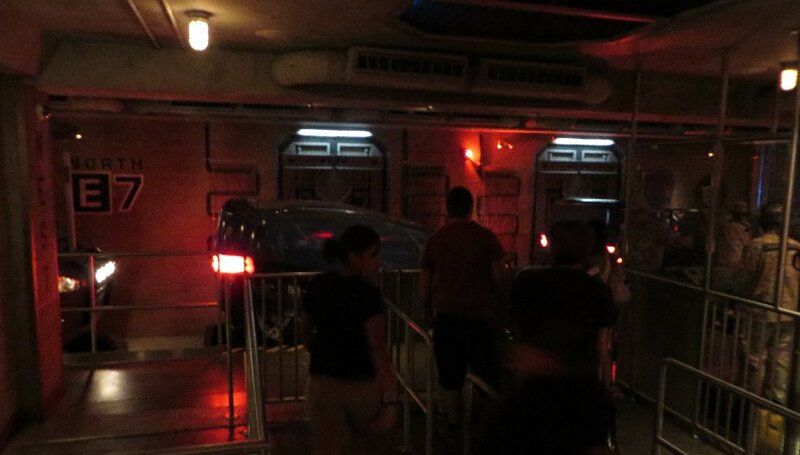 Getting down to the Lower lot requires going down four escalators (or walking down a lot of stairs). 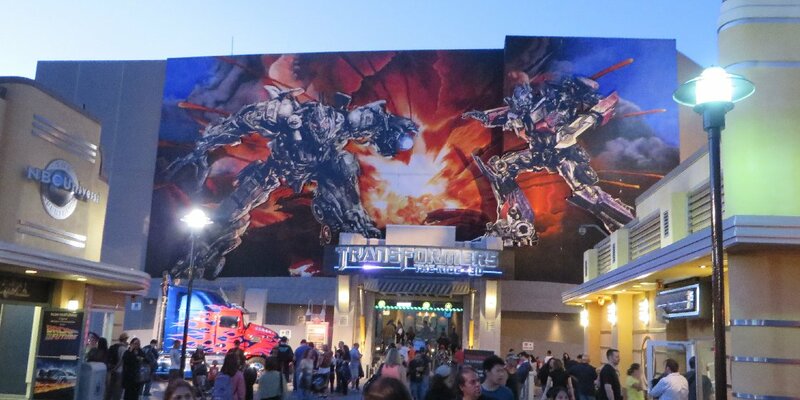 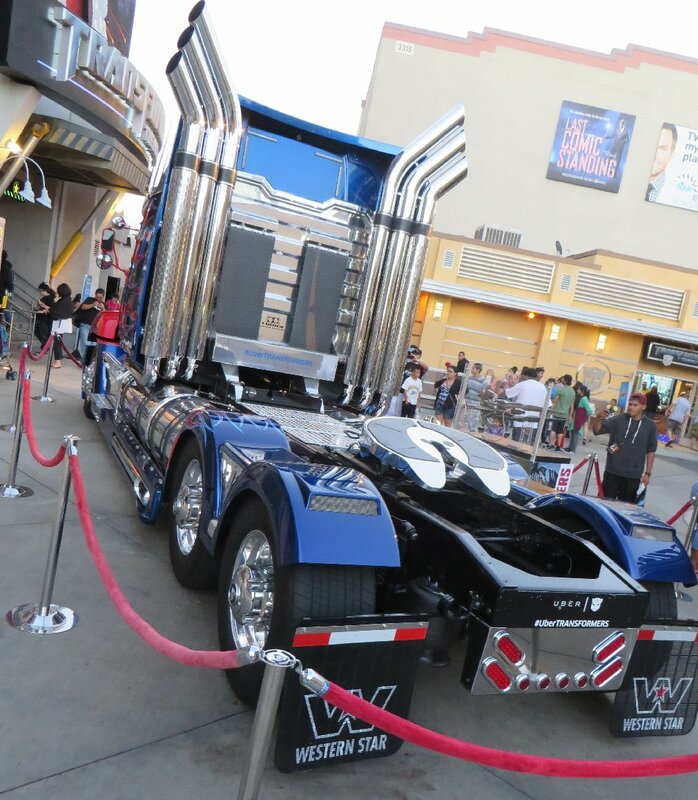 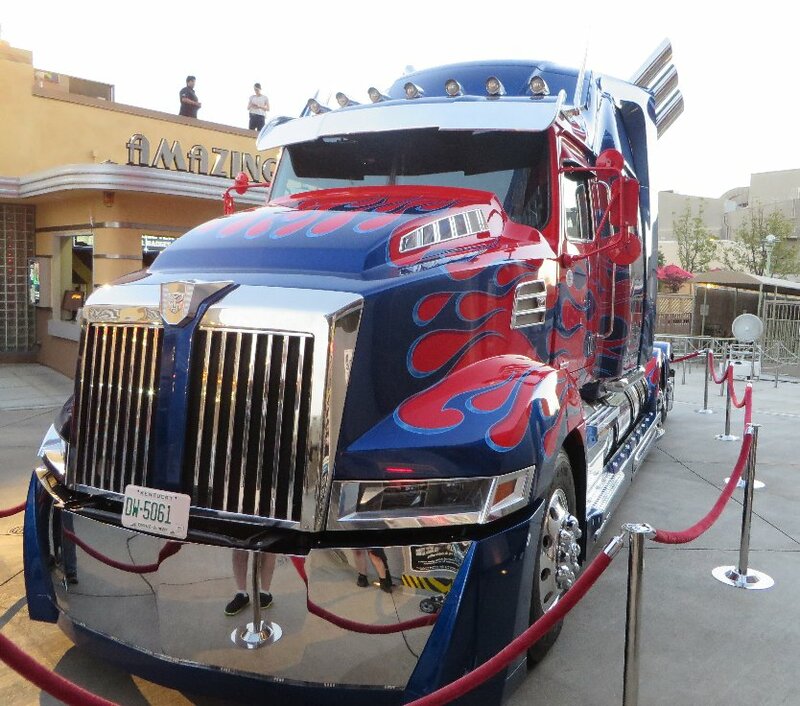 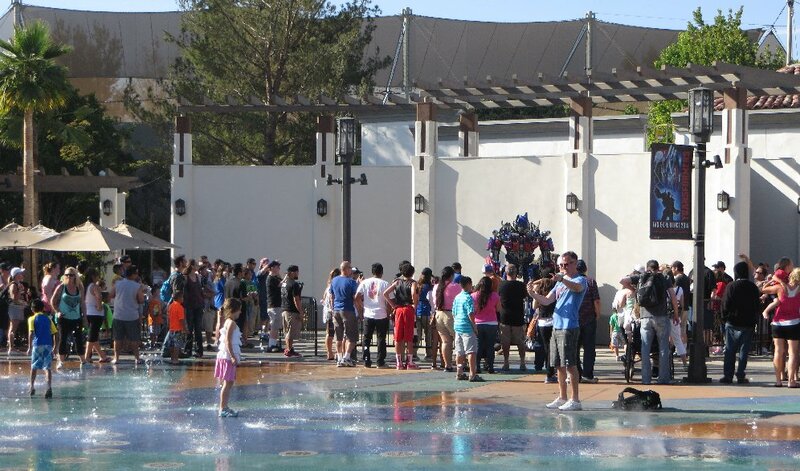 The front of the Transformers Ride, with character costumes and Optimus Truck out the front. 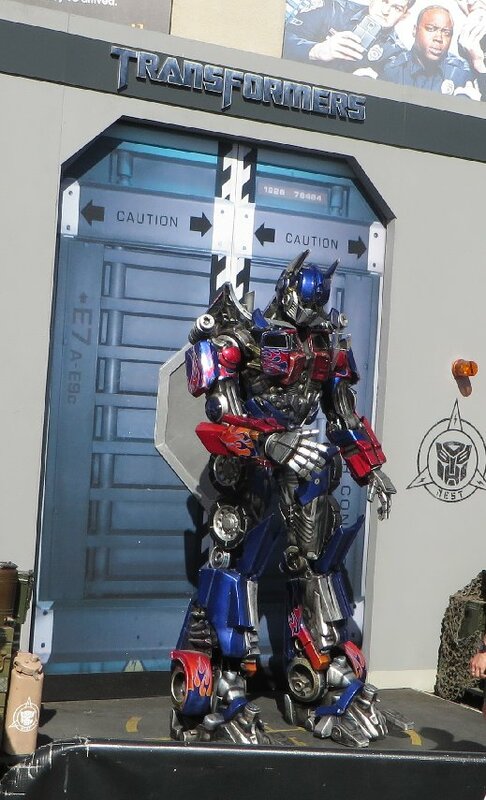 Throughout the day, we had Optimus Prime, Bumblebee and Megatron characters for people to get their photos taken with them. 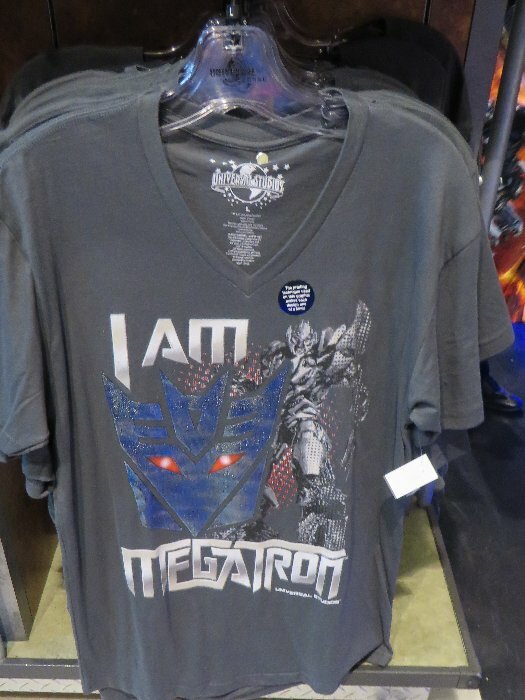 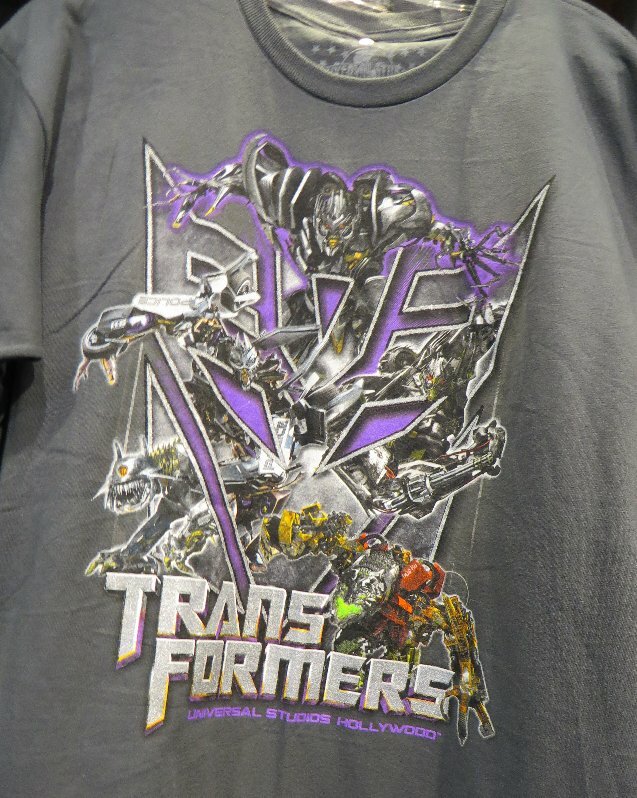 Megatron is a newer addition, as they only had Optimus and Bumblebee at first for a while. 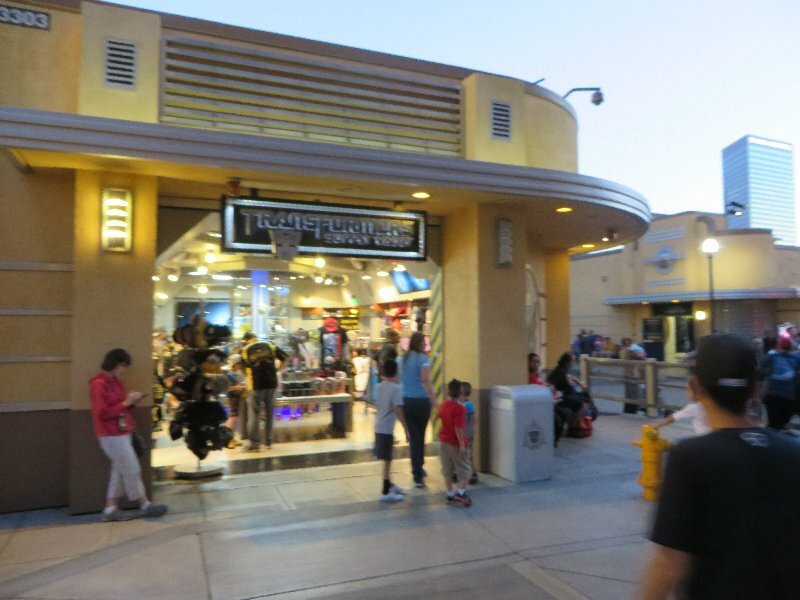 They also appeared to have multiple costumes as the three characters were also at the Upper Lot Plaza as well. 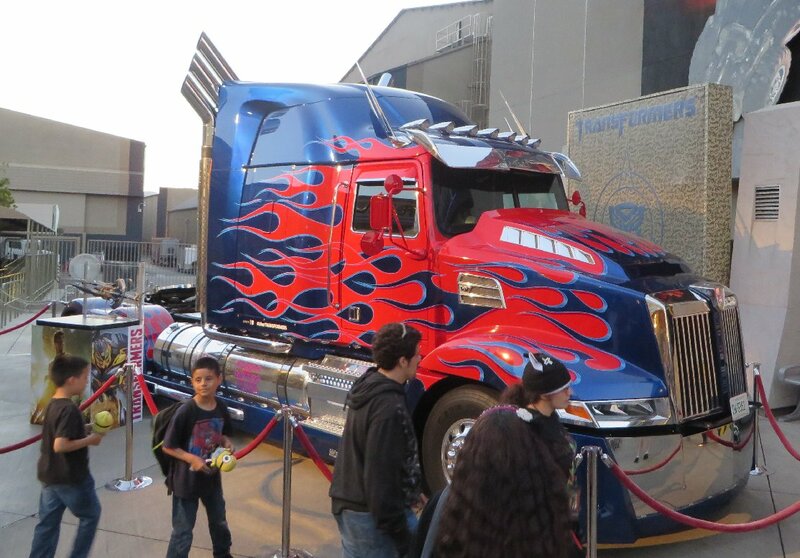 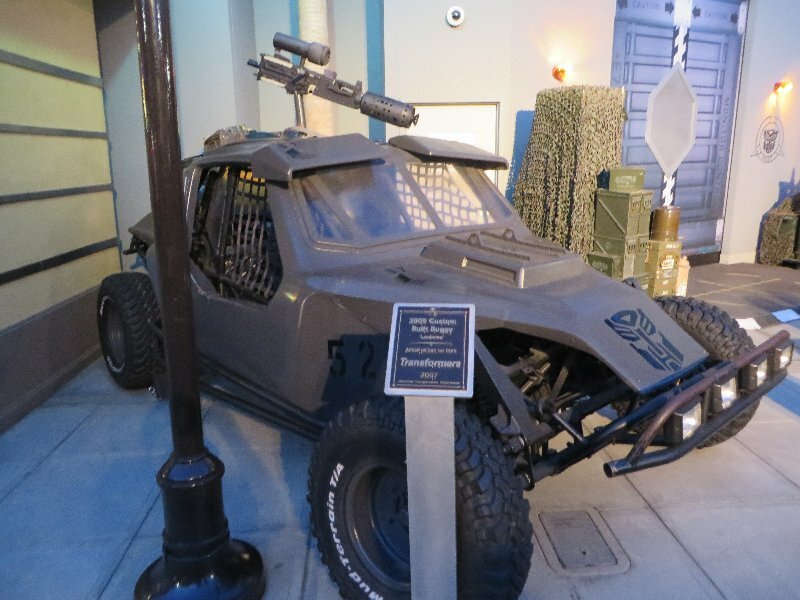 One of the Trucks (apparently) used in the Movie. 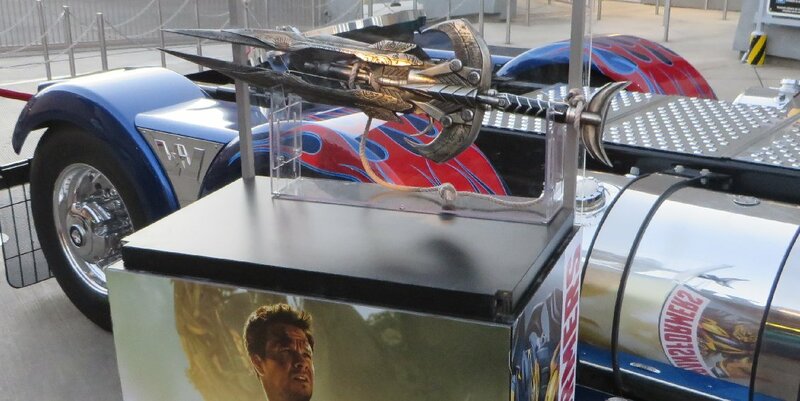 And the alien sword/gun prop from the Movie. 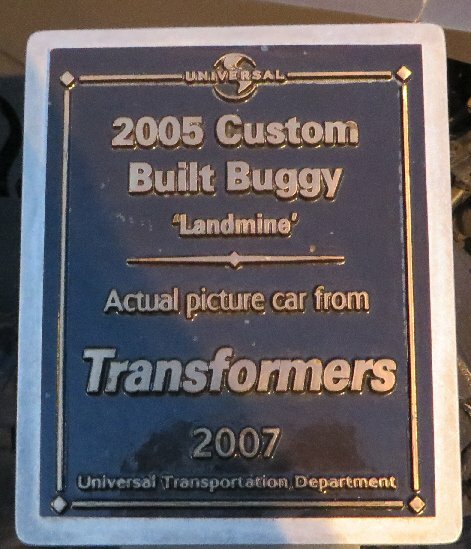 Another vehicle from the first Movie, which was later released as a toy called Landmine (but was not a robot character in the Movie). 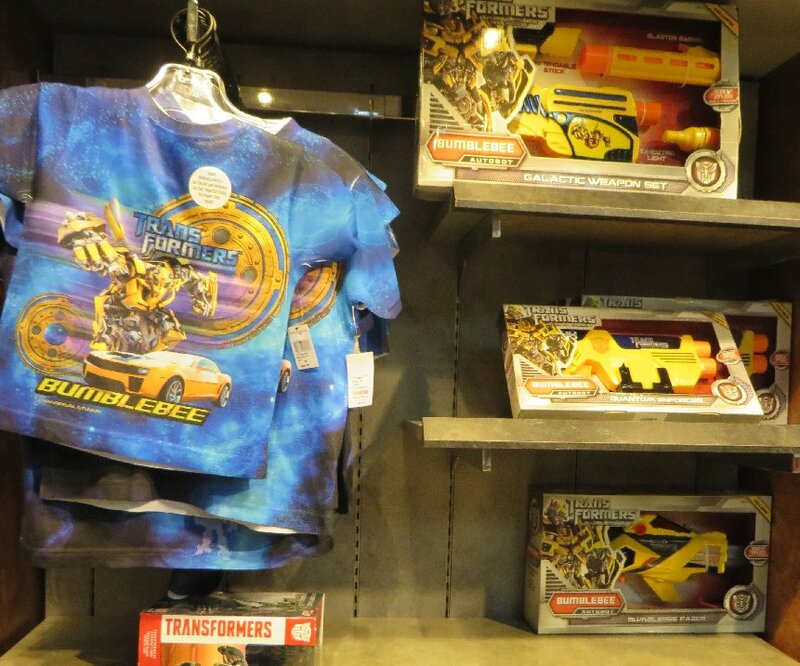 The souvenir shop outside the Ride, which you see as soon as you exit the ride (most rides have the gift shop enclosed with the Ride, so that you have to walk past all the stuff to get out). 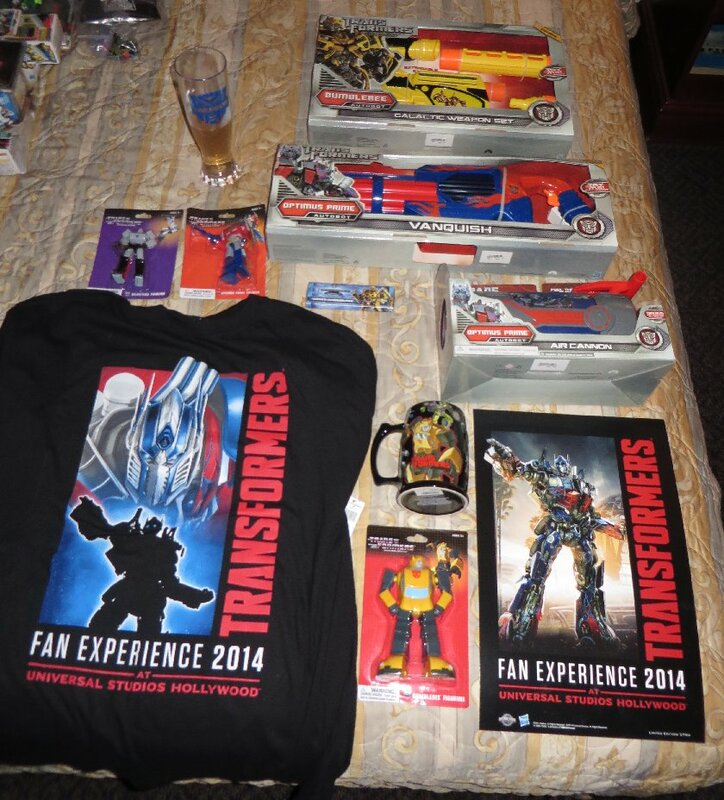 Inside, with a lot of new stuff since I was there in September 2012. 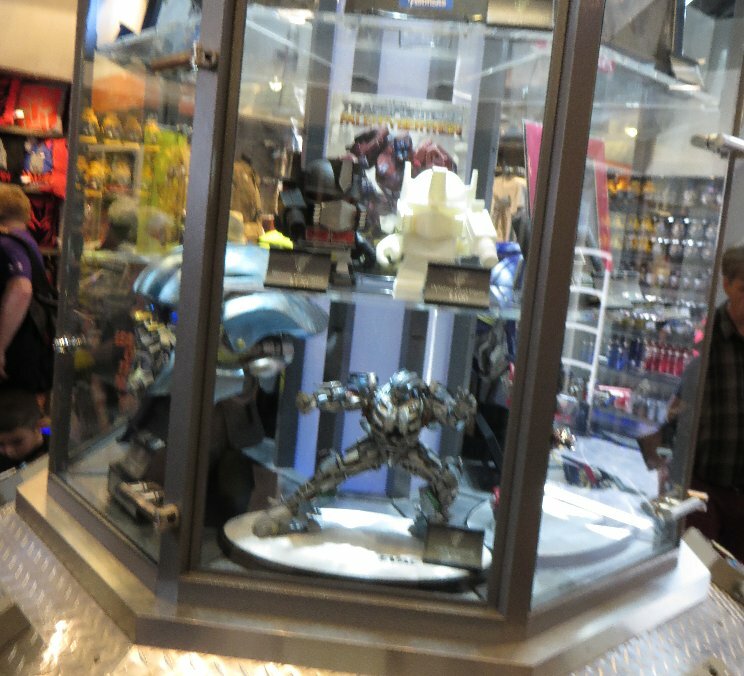 As noted in Part One, it appears as though their exclusive Deluxe Evac toy sold out prior to this visit, as I couldn't find it anywhere, even at the start of the day (so wasn't just snapped up by fans on this day). 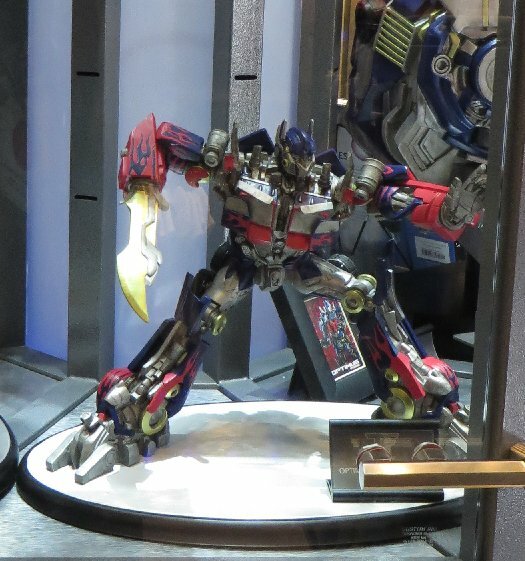 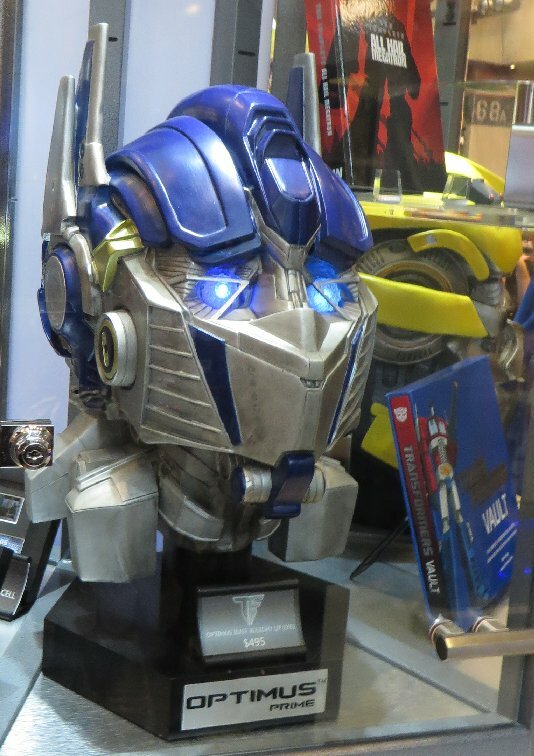 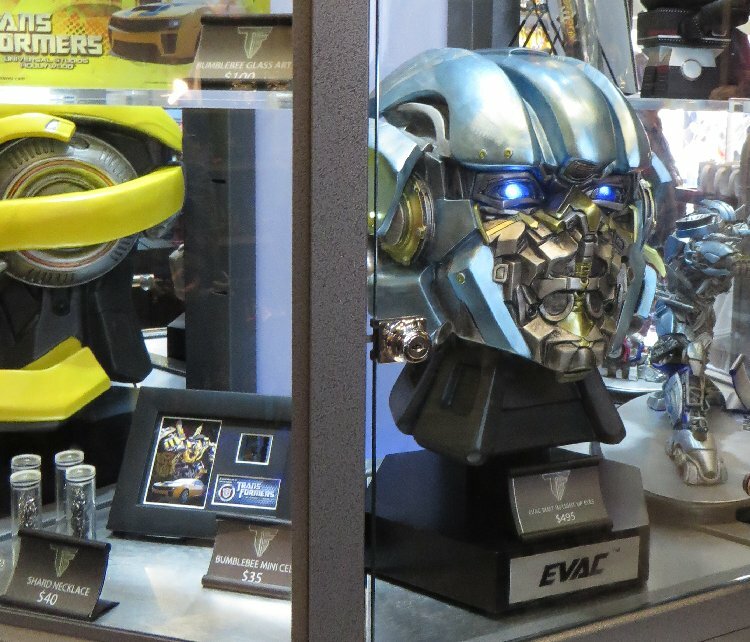 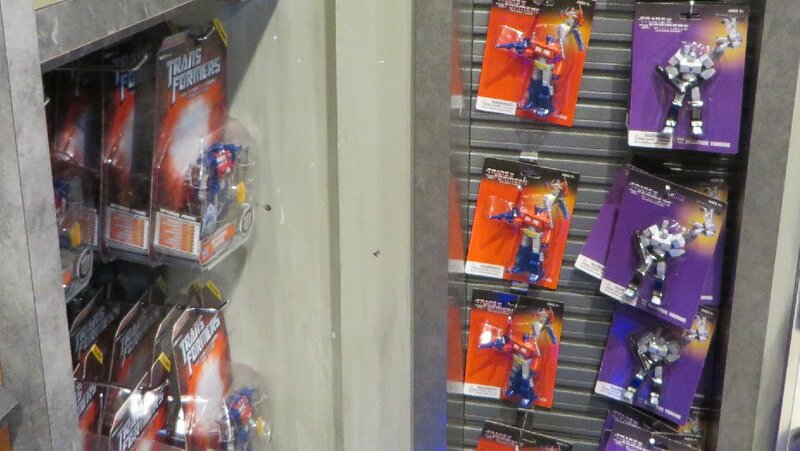 A number of expensive, detailed statues and heads - Evac, Optimus. 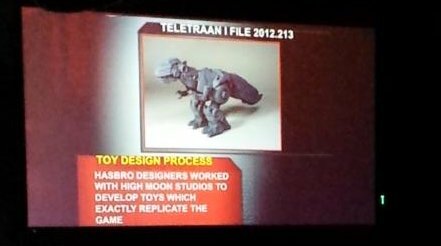 There were three figurines which are new in the last year, of Gen1 characters of different sizes to each other. 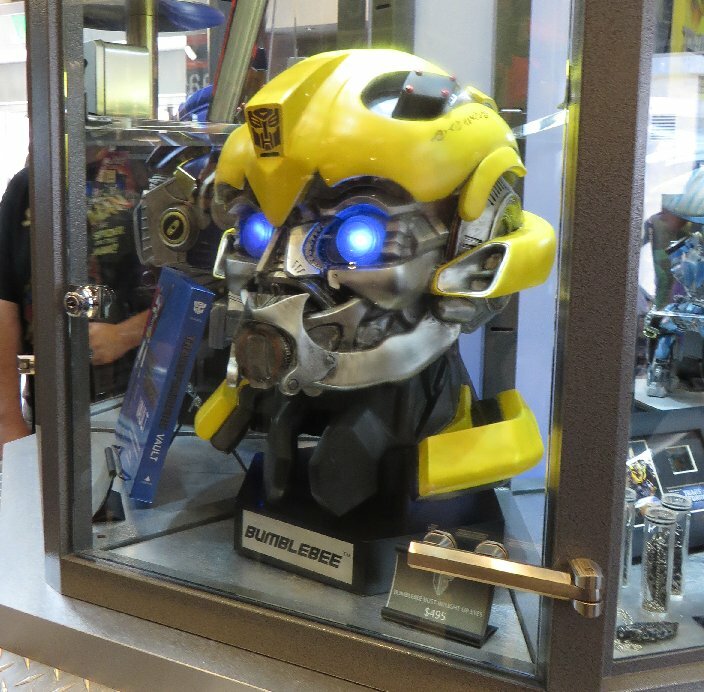 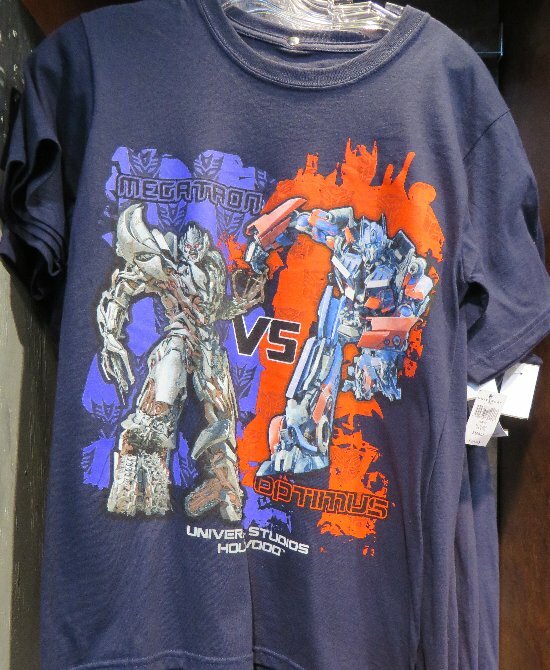 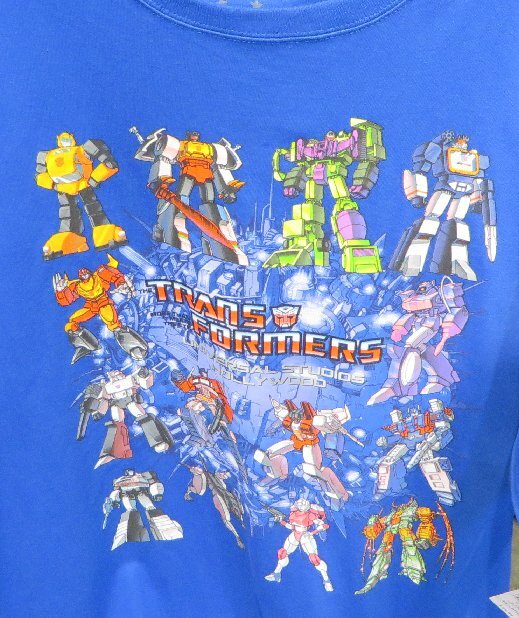 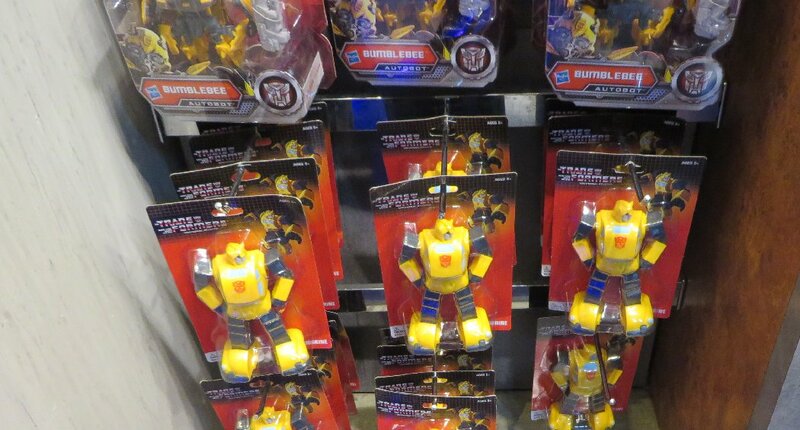 The three characters are obvious (to go with all their other merchandise that is predominantly Movie Optimus, Bumblebee and Megatron), but why Original Series versions that don't move, and are not in scale to each other (Bumblebee should be smaller, but is 50% bigger than Optimus and Megatron). 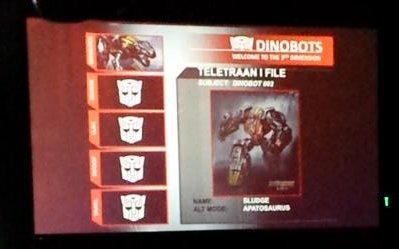 Three new Roleplay weapons this year... a Bumblebee Galactic Weapon Set that is electronic and has three modes (with the previous two Bumblebee weapons). 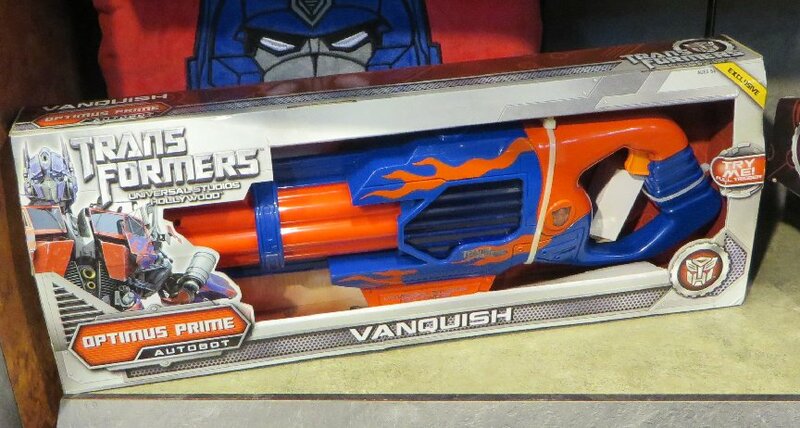 Plus two Optimus weapons - the Vanquish (electronic gattling gun, below) and a pump-action air cannon (further below). 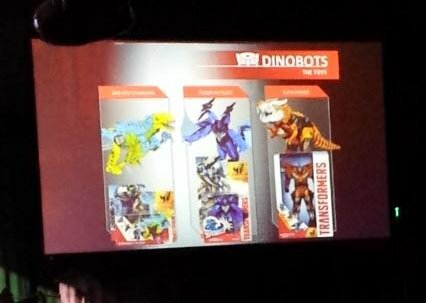 A Loyal Subjects Grimlock and Gen1 Soundwave. 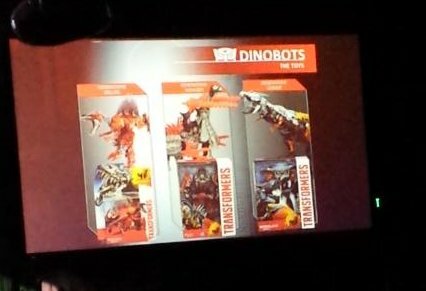 Dinobots... cashing in on this year's theme. 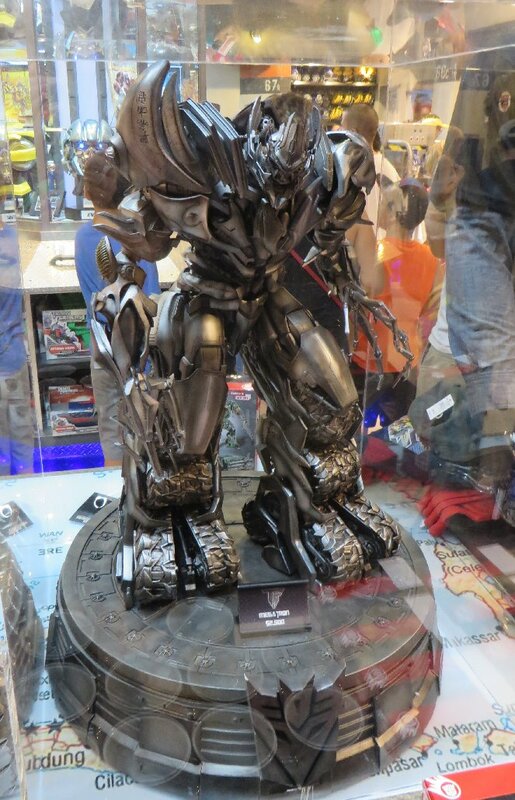 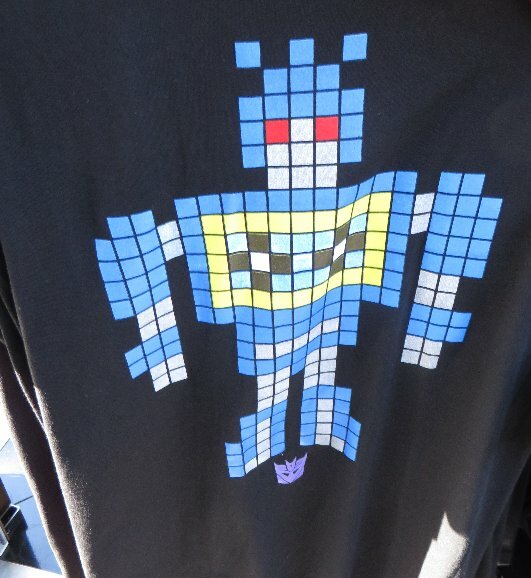 My favourite one (which is an old one), and a Movie Megatron. 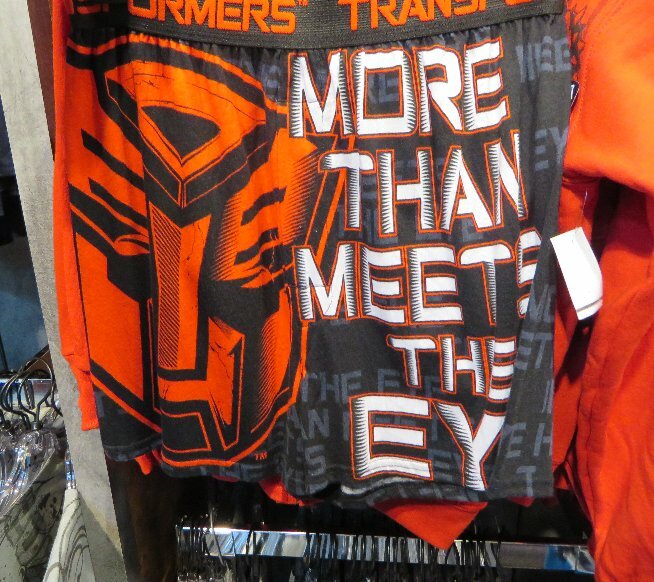 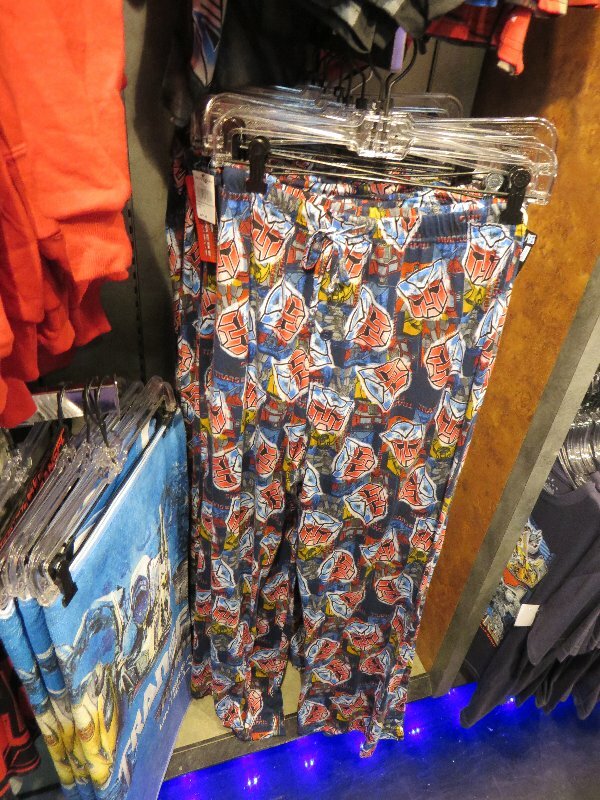 And clothing for the bottom half. 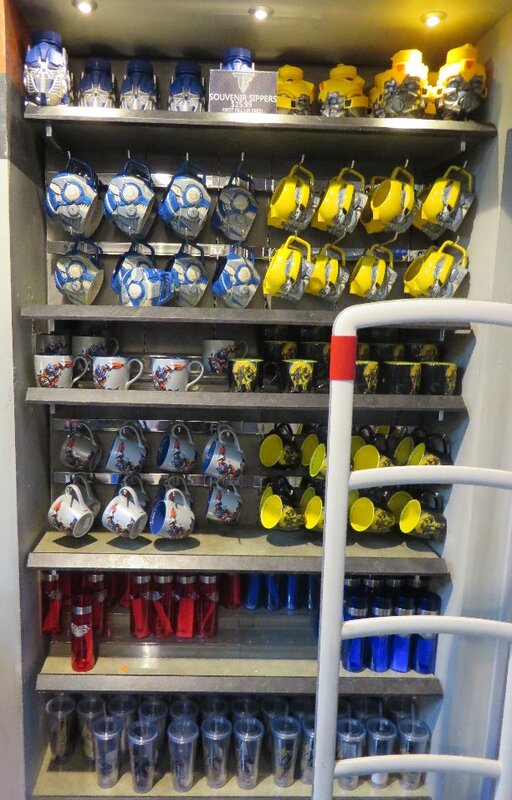 Cups, Mugs and drink containers with lids. 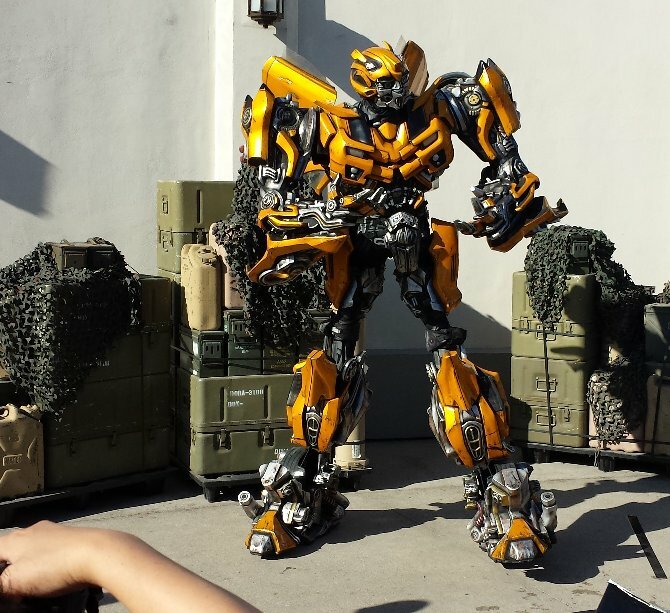 Roleplay guns - Bumblebee Galactic Weapon set, Optimus Vanquish, Optimus Air Cannon. 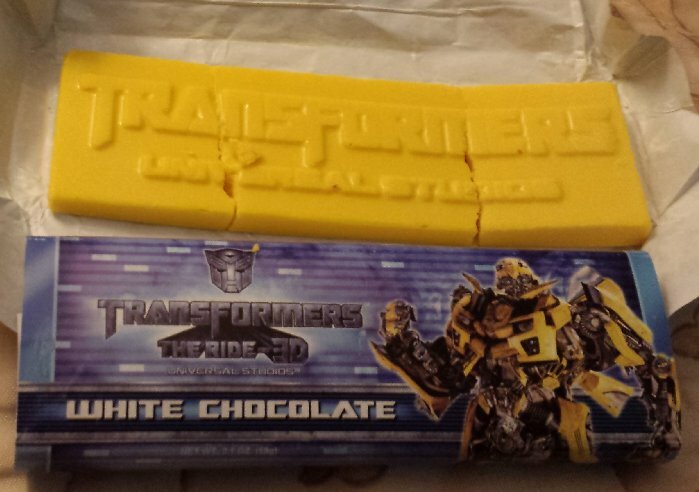 A closer look at the "white" chocolate bar. 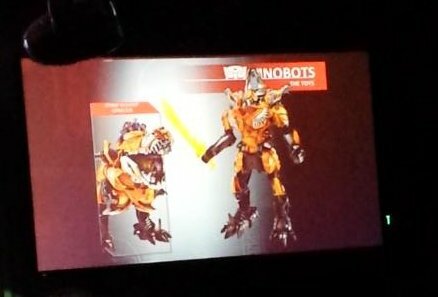 It is certainly Bumblebee themed, but they could have mentioned it on the packaging, so that it didn't look weird unrapping a yellow chocolate bar. 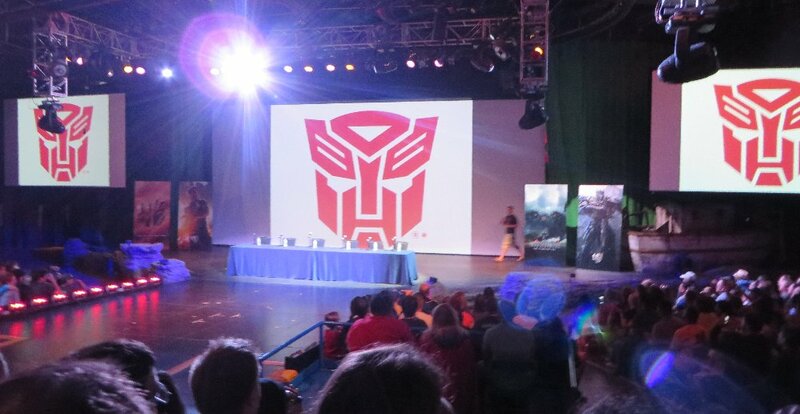 After a go on the Transformers Ride and another look over the gift shop, I headed back to the Upper Lot for the Hasbro Presentation. 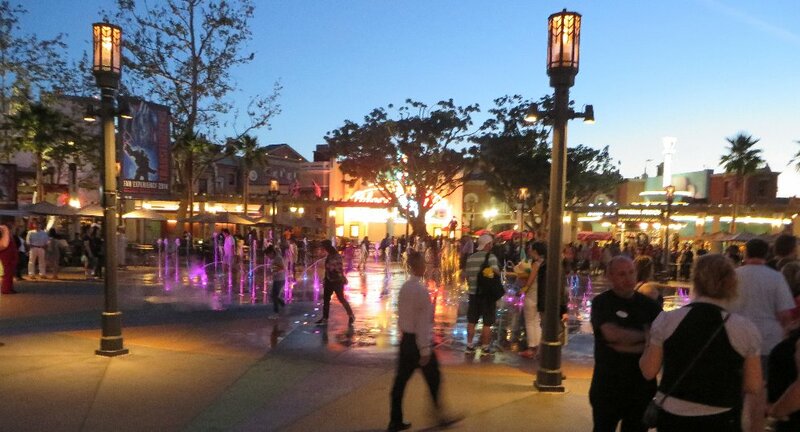 It was about 8.30pm, so I had another look at the Plaza to see if anything different was happening compare to earlier in the afternoon. 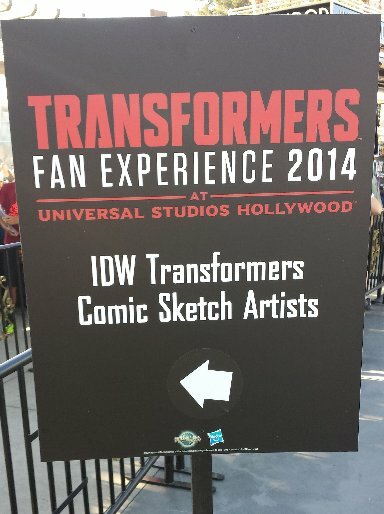 This area was refered to as the "Fan Zone" on our badges, with the "goody bag" pickup point, character costumes, and IDW artists. 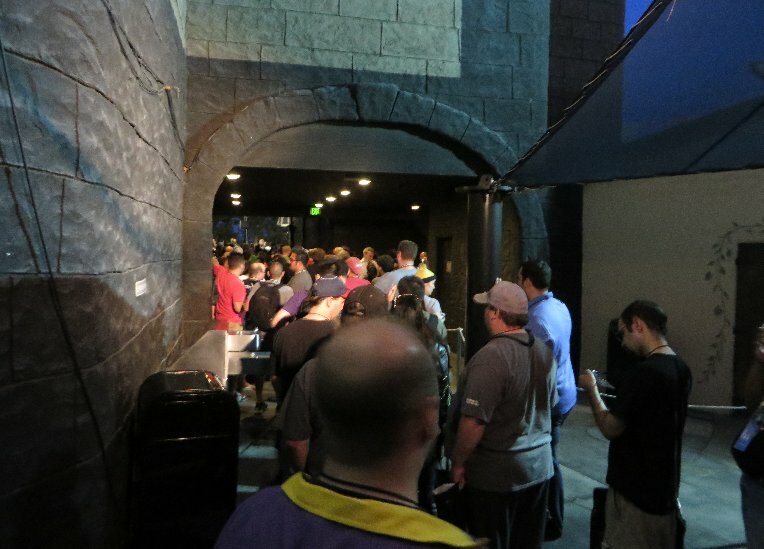 The Fan Zone was noted as only set up from 8pm, but all three things were happening from at least 5pm. 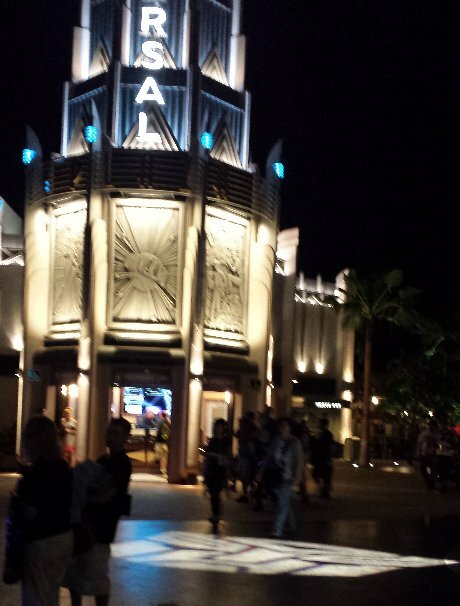 At night, the lights were on, and people were still everywhere. 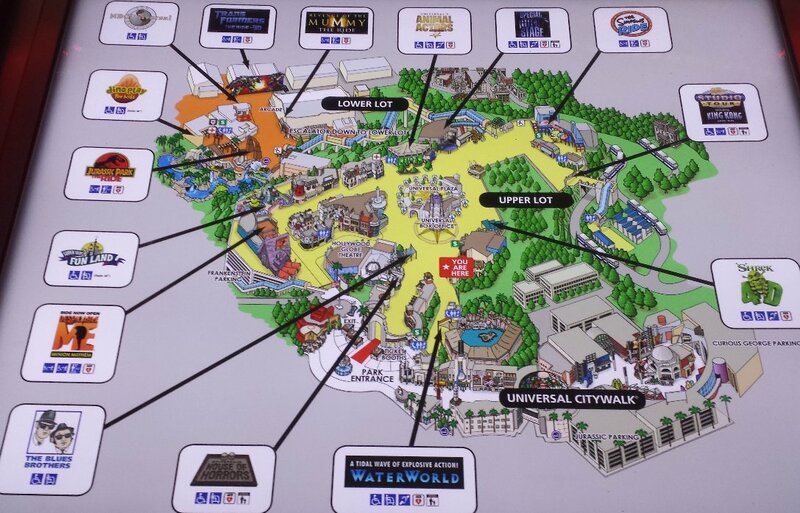 The area for character costumes, which was a constant tag-team, with one coming out as soon as one went out the back. 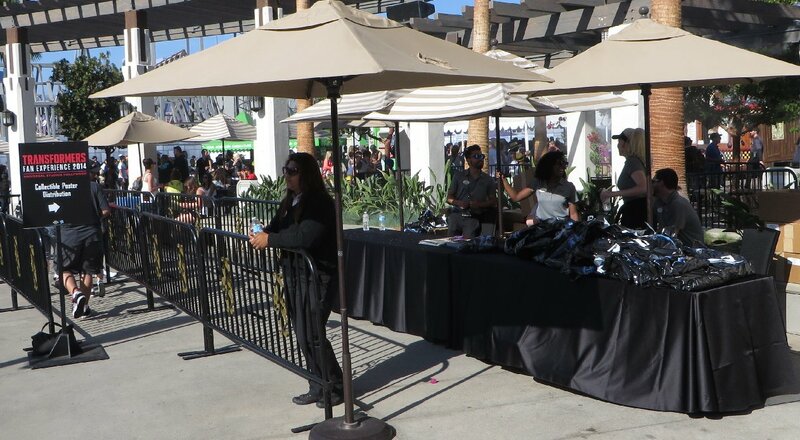 The "goody bag" pick up point... picking up a poster and bag with a pastic tumbler, getting your badge punched to make sure people didn't keep going back for more free cups. 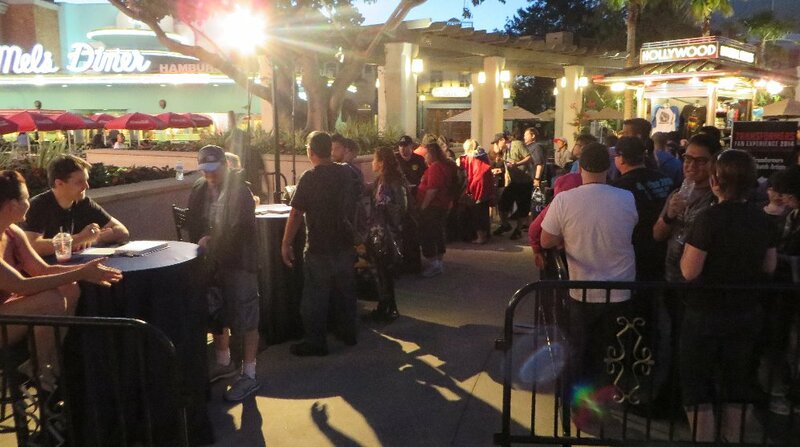 And another fenced off area for people to meet IDW artists, and get things drawn or autographed. 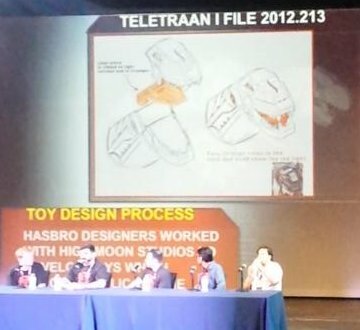 At quarter to nine I went to the Special Effects Stage to line up for the 9pm Hasbro presentation. 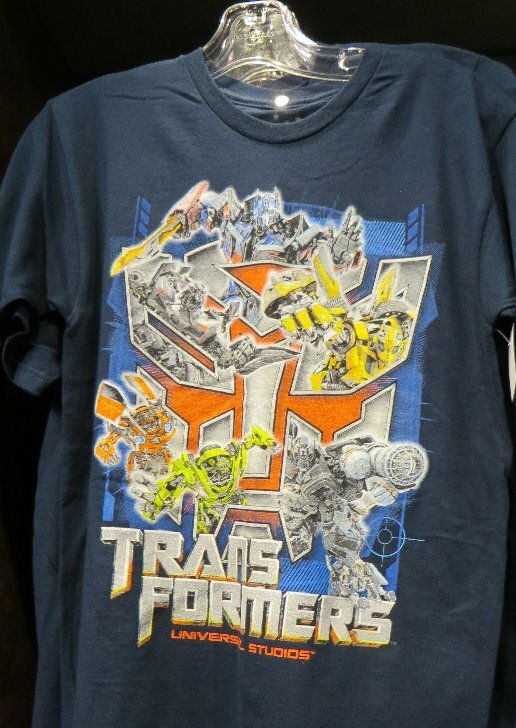 Inside, set up with a lot of Universal Studios logos, to make sure we didn't remember that Transformers was done by a competitor, Paramount. 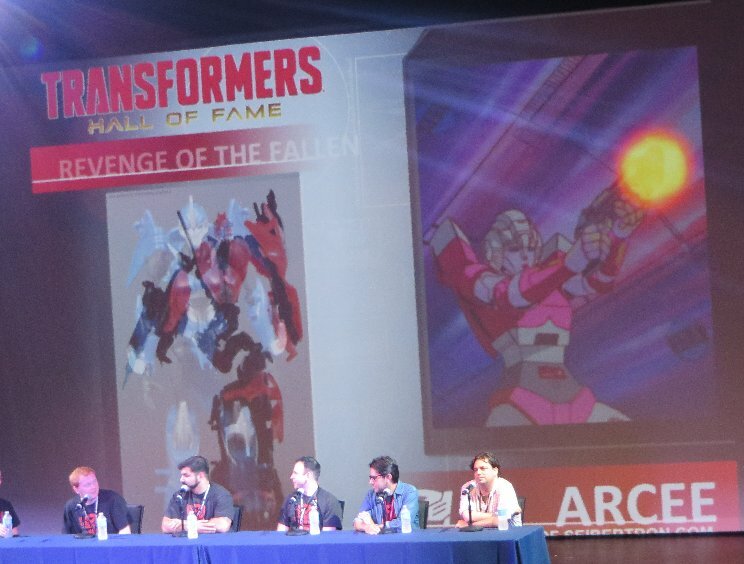 9.05pm the show started and the hosts entered the stage. 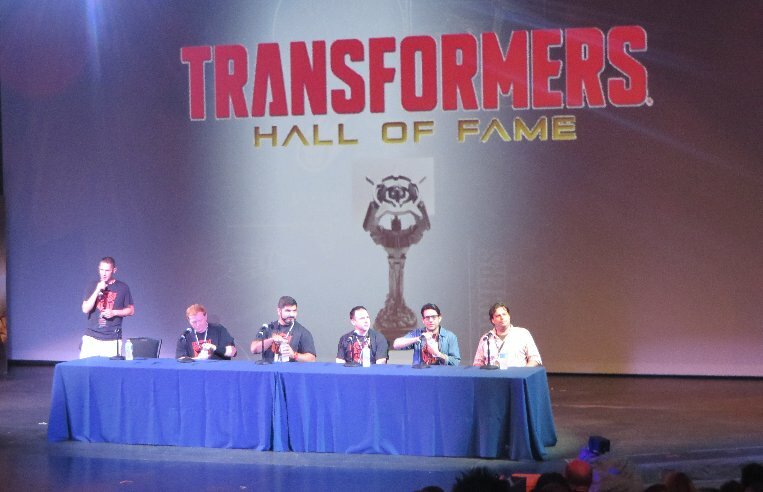 Most were Hasbro people - Ben is marketing for Hasbro Interactive, Mark is marketing for Transformers, the next three are Desighers, while John Barber is from IDW. 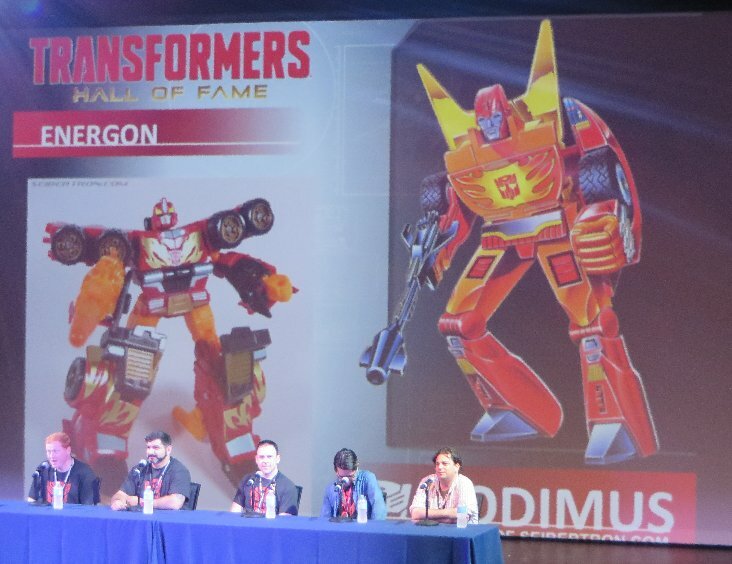 First item on the agenda was this year's Hall of Fame inductees. 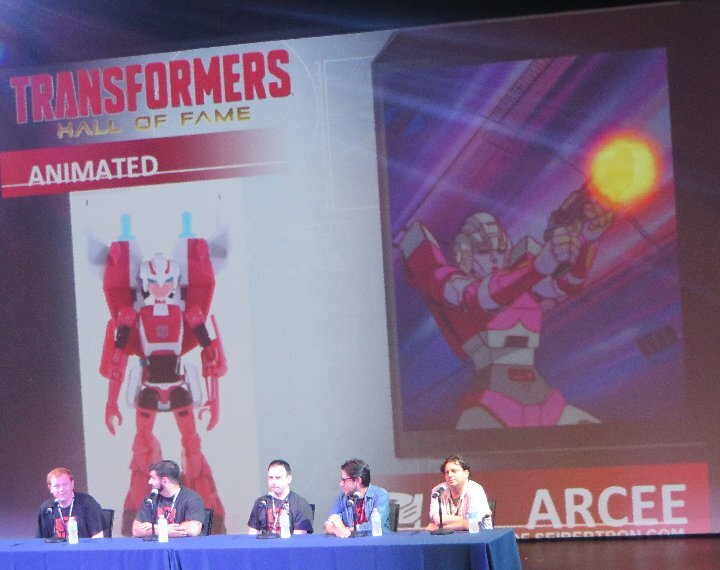 The first of two robots - Arcee. 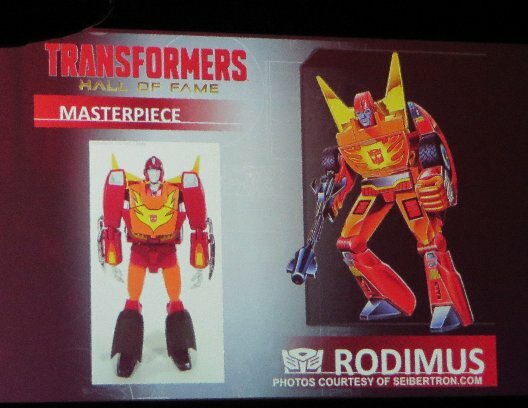 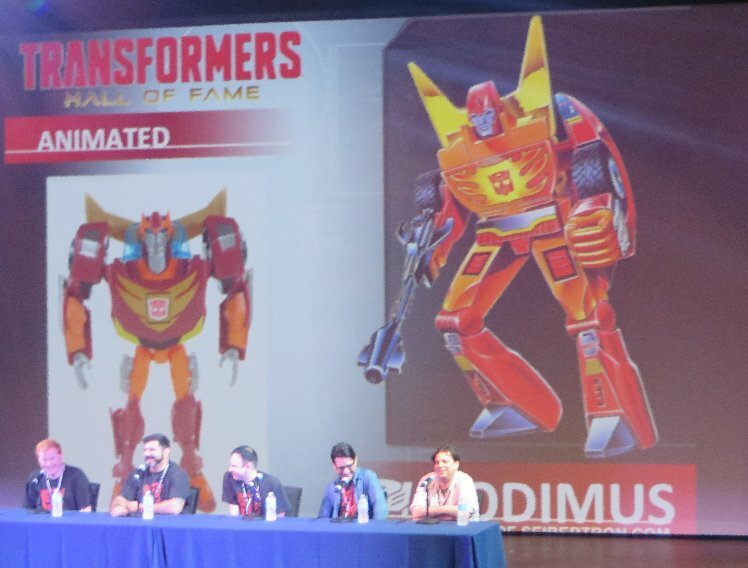 The second Robot - Rodimus. 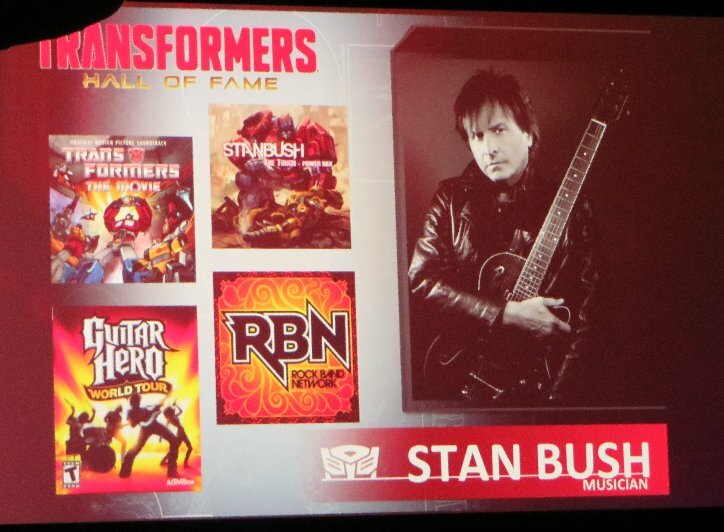 Then there was the Human Inductee - Stan Bush. 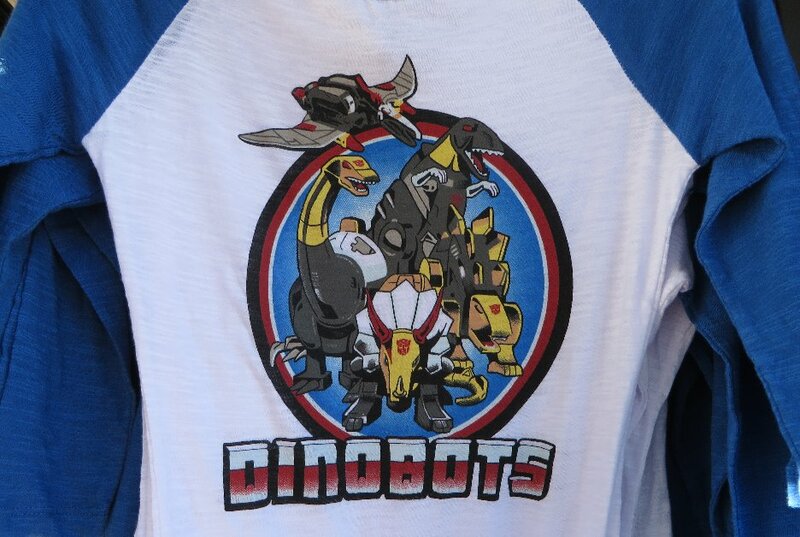 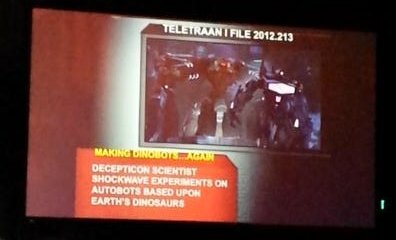 9.12pm - Next up was an historical look at this year's theme of Dinobots. 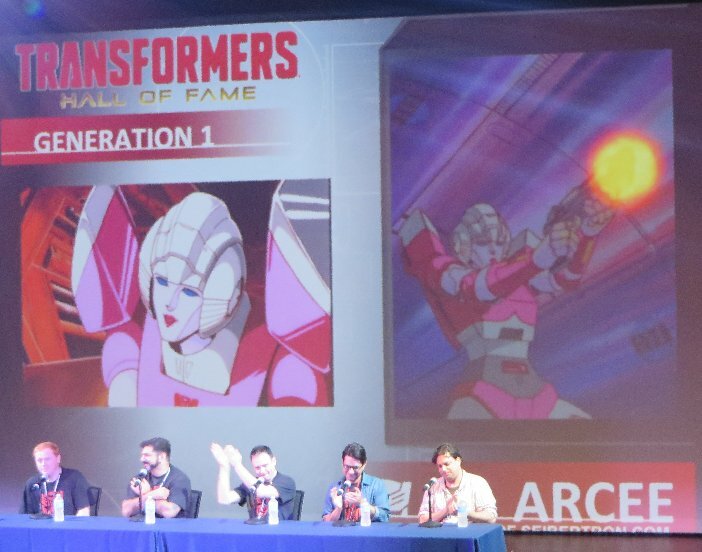 PART 1 - Generation One. 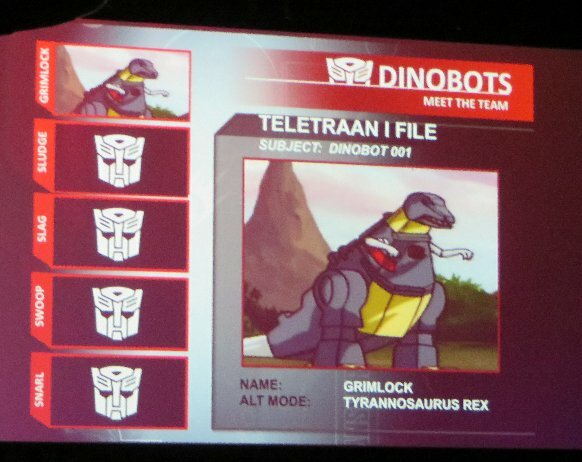 It started out with a few minutes from their introduction in the original cartoon. 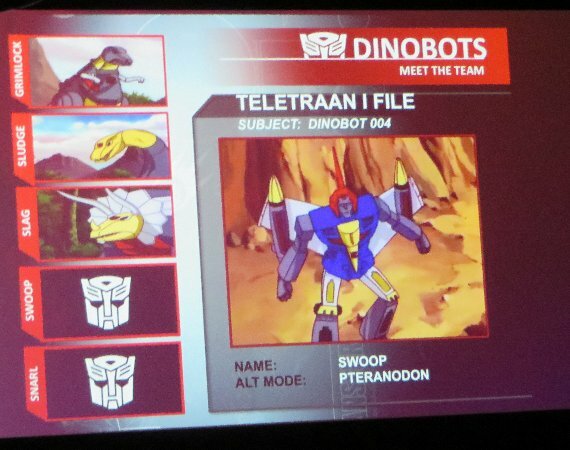 Then a quick look at each of the original series versions...including their original names... with clips from the cartoon of each character. 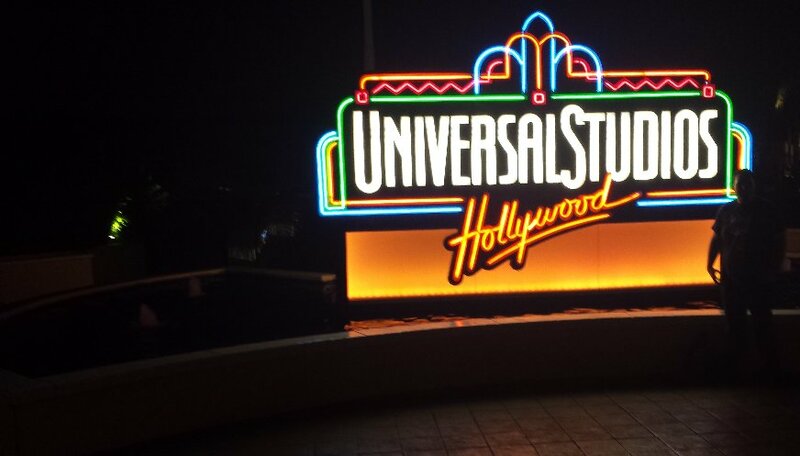 9.17pm - this was when my camera battery died, and after fumbling around trying different batteries for about five minutes, I then had to use my phone's camera for the rest of the presentation... but since I dropped and lost my pen at about while trying out the other batteries, I had to resort to filming (with audio) instead of taking photos with my phone (and keep taking notes). 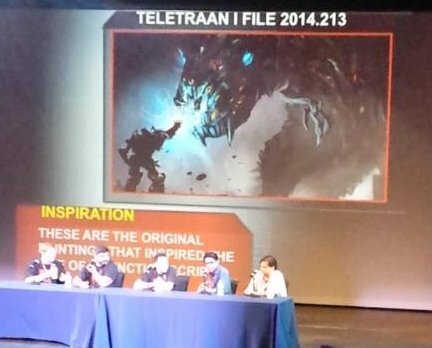 Also, since the power was running low on the phone, I didn't risk taping all of the remaining presentation... 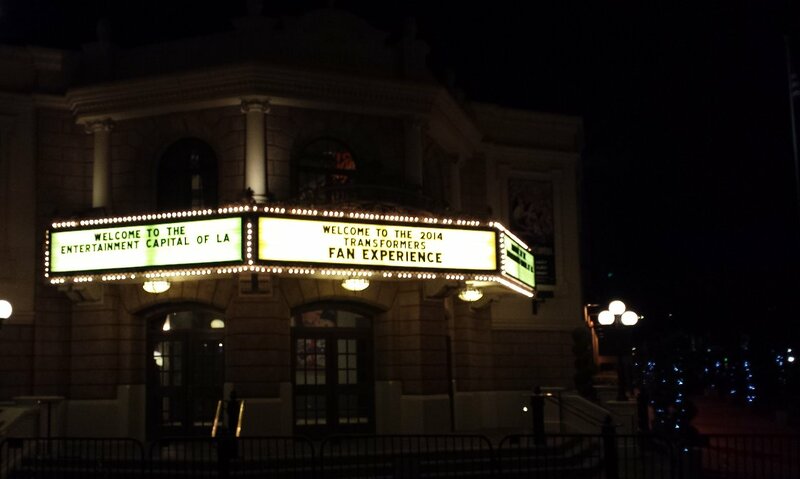 I had to be selective so that I had enough battery left to photograph Stan Bush's concert. 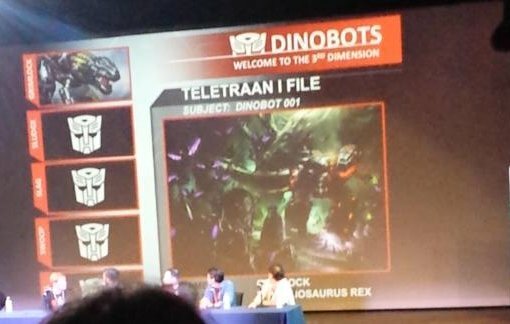 During this time of me stuffing around with my camera and batteries (digging around my backpack as well, looking for one of the two spare batteries, which some how ended up in the Locker...typical, but I found later that it was flat too, so wouldn't have worked anyway), the panel went on to talk about how the appearances and characteristics of the original five Dinobots went into the design of the Movie Dinobots. 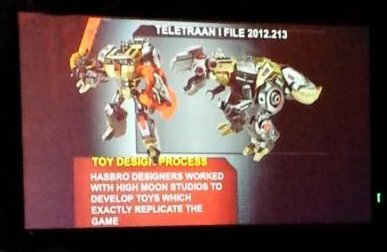 For example, shiny parts, and bulky or sleek as per the original. 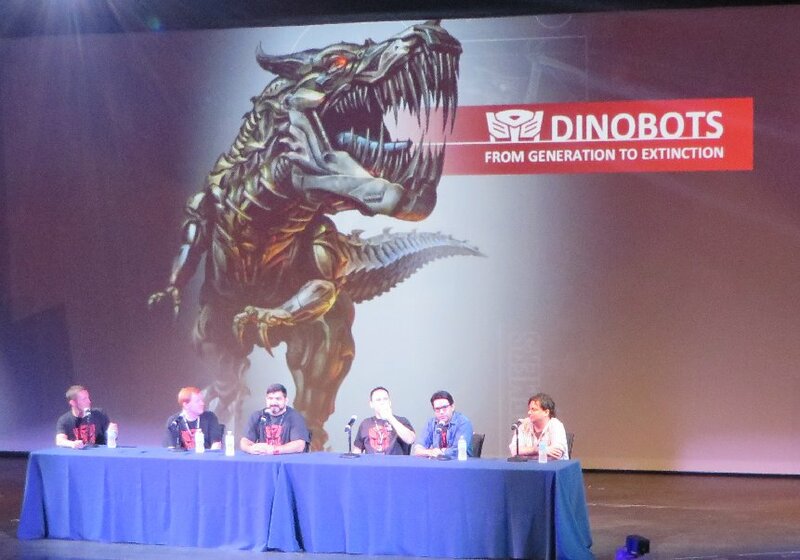 9.18pm - Each talked about their favourite Gen1 Dinobot and why. 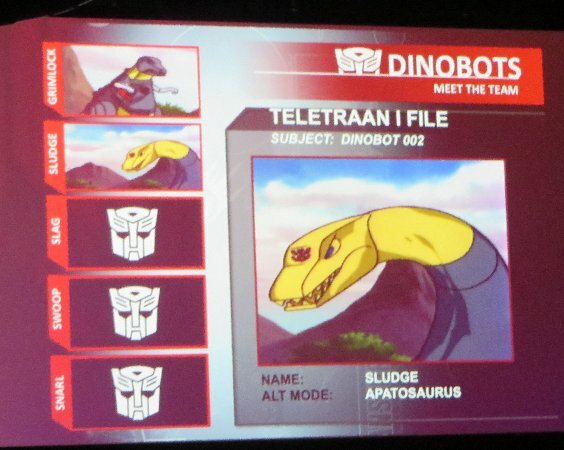 9.19pm - PART TWO - Animated. 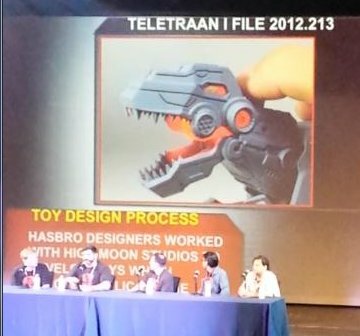 One of the designers on the panel was around at the time of Animated, mentioning designer Eric Siebenaler and Aaron Archer for those toys. 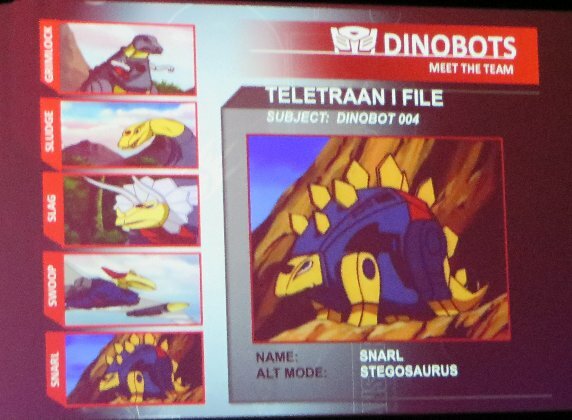 Showed some clips from the Animated cartoon and their character images... and mentioned the reason for Snarl being a triceratops (they couldn't use Slag anymore in the UK, because of its derogatory meaning there). 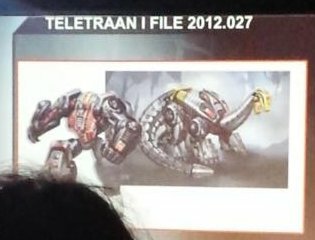 They said that the weapons of the three Dinobots designed to look like they were made of fire to link the "subgroup" characters. 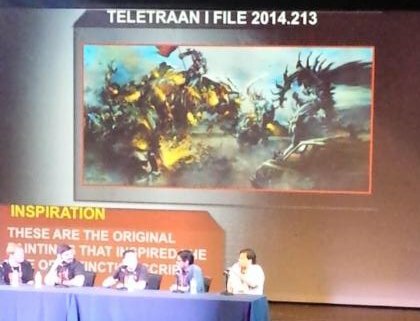 9.25pm - Each said what they were doing during 2008 when Animated started. 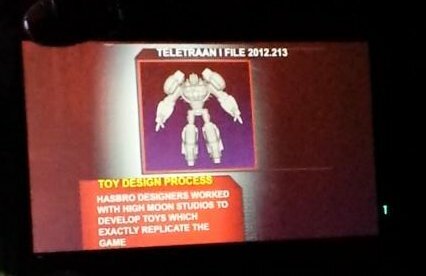 Lenny (Designer) - Working on Animated Spiderman toys. 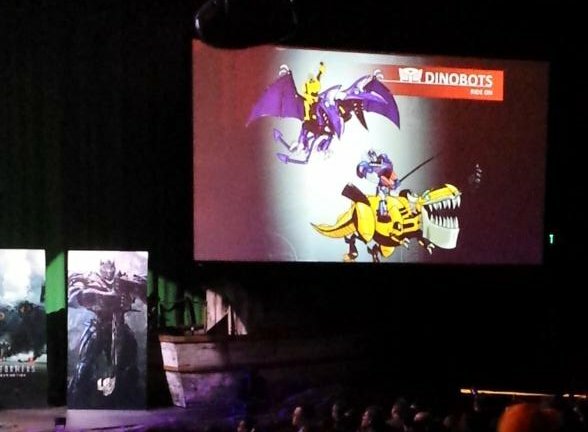 Bill (Designer) - Working on animatronic dinosaur toys. 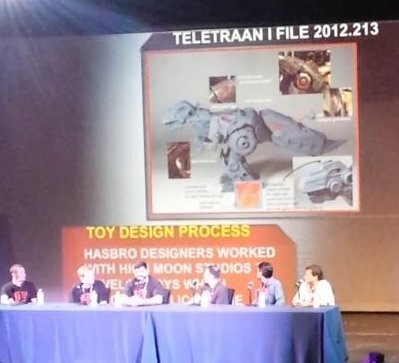 John W (Designer) - Working on GIJoe toys. 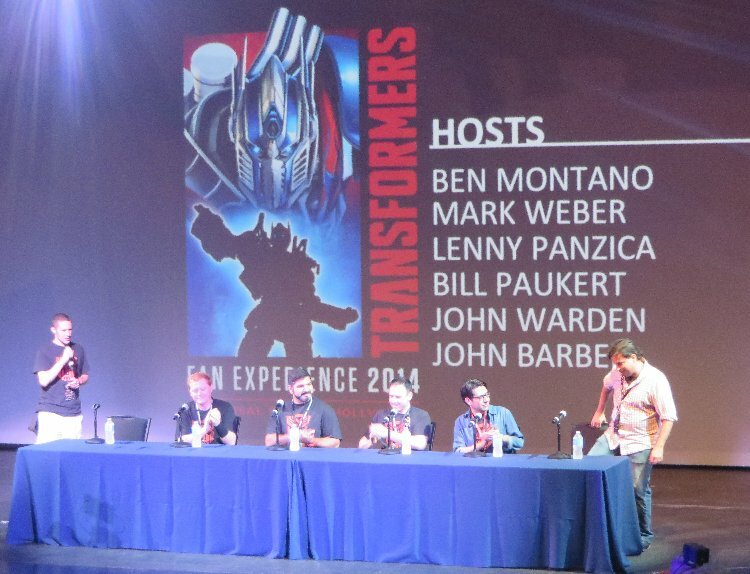 John B (IDW) - Editing Wolverine comics. 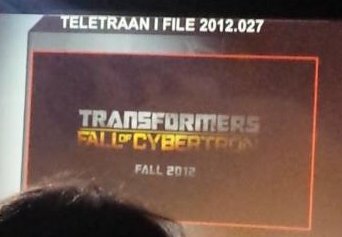 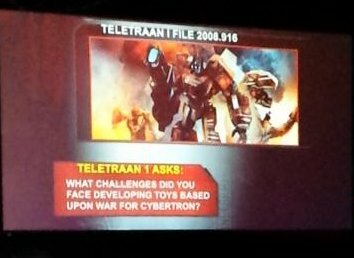 9.26pm - PART THREE - War For Cybertron era, they showed that Fall of Cybertron game promo trailer with the slow song, that featured Grimlock. 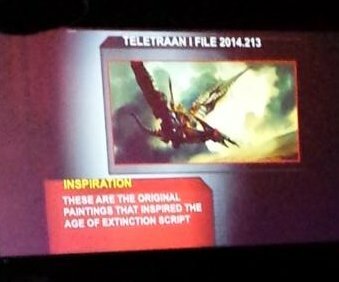 Explained how they wanted to create a new origin story for the Dinobots, using Shockwave as the catalyst this time. 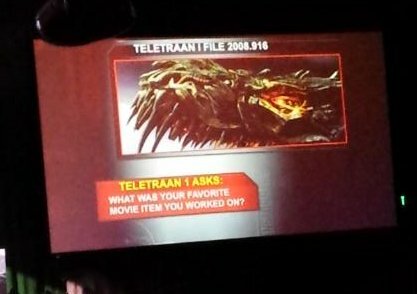 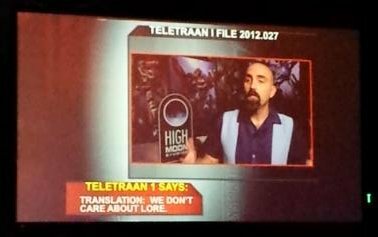 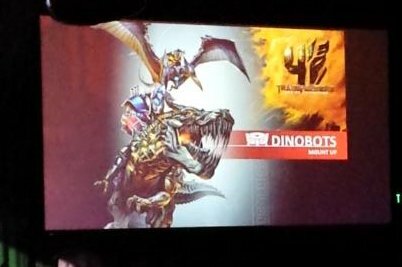 Showed a clip of game director Matt Tieger from High Moon Studios, talking about why and how he introduced the Dinobots in the WFC universe in a brand new way from their Gen1 cartoon or comic origin. 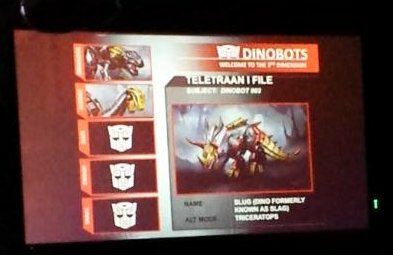 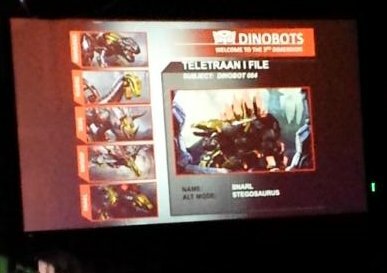 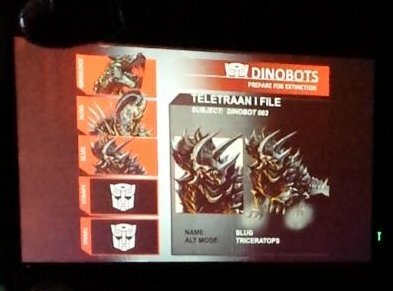 Concept art on each of the Dinobots in the game... including Sludge (who wasn't actually in the game). 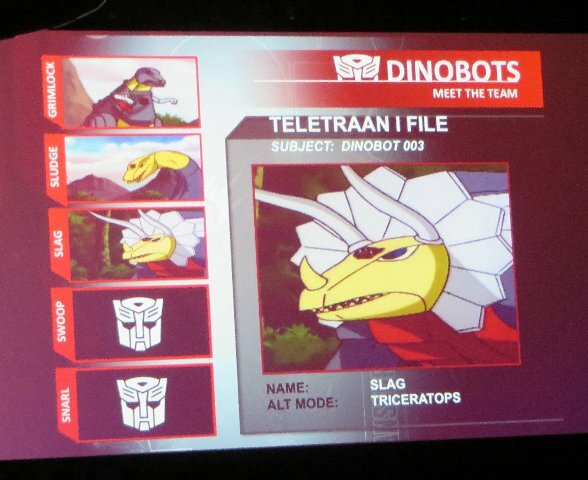 The first usage of the name Slug... noted as "the Dino formerly known as Slag". 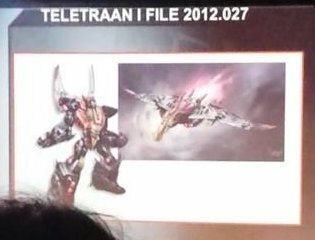 Finished with talking about the FOC Grimlock toy, to make it look like the game concept images... including, making it look like it was breathing fire. 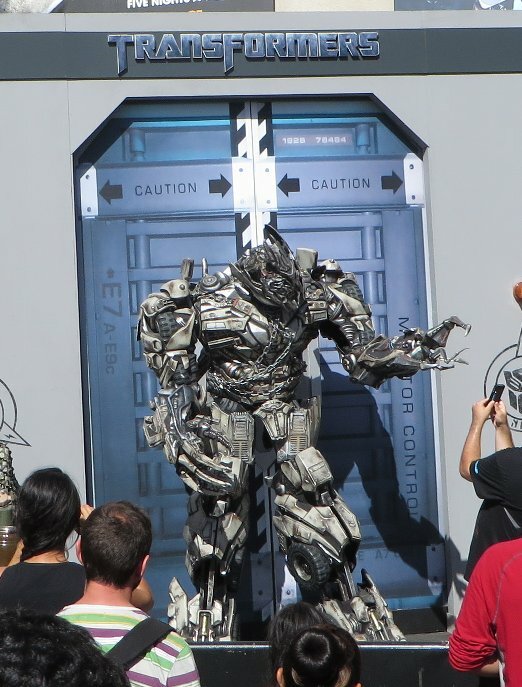 9.37pm - PART FOUR - Transformer 4, Age of Extinction. 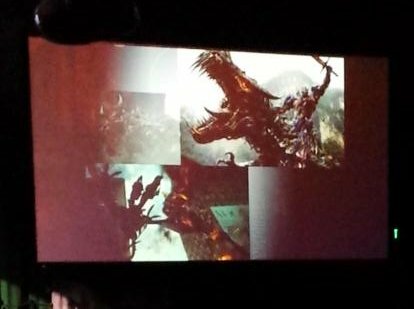 Starting with the full trailer. 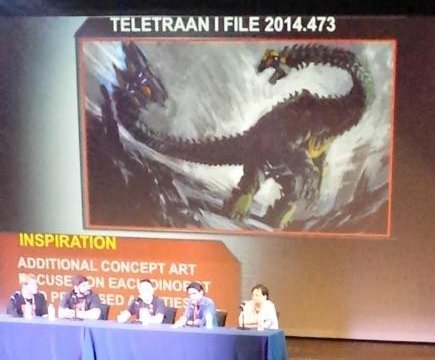 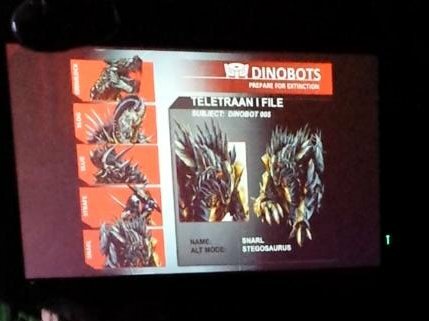 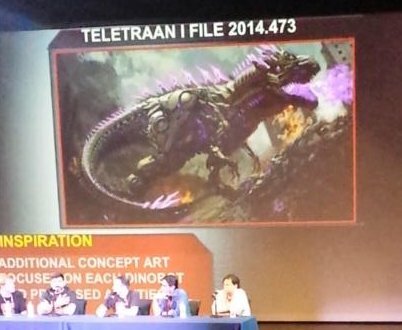 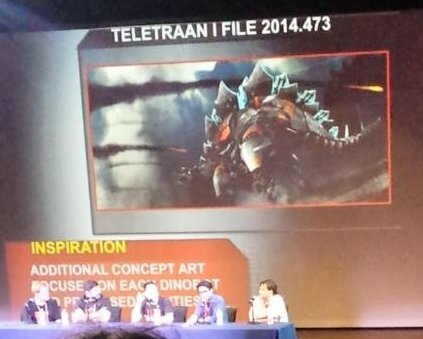 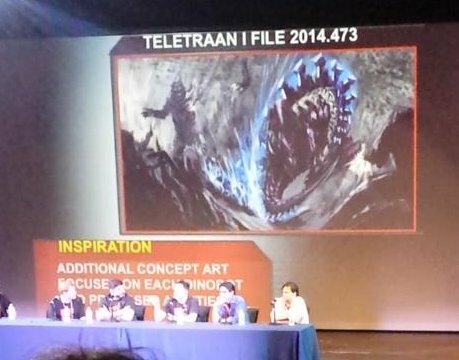 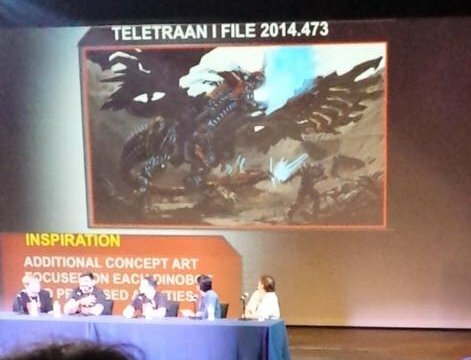 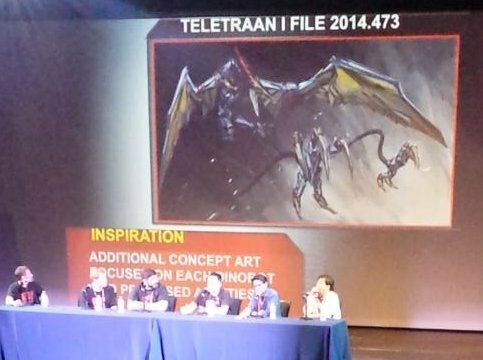 9.41pm - Showed us some original concept art for the Movie Dinobots, which are a lot more Gen1-ish than what the Movie people ended up giving us in the finished film (and ultimately, the toys). 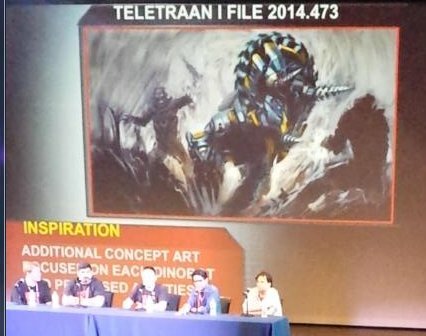 They wanted to give the original concepts a primal, visceral look, based on the earliest scripts describing the Dinobots as "barbaric knights"... which led them to design a lot of the Dinobot heads to look like knight helmets. 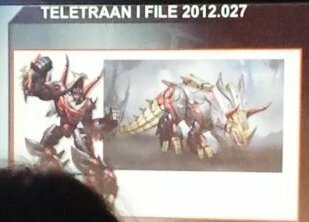 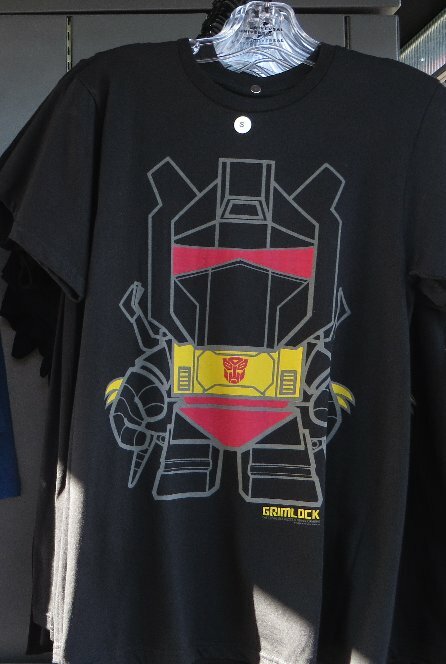 Two pieces with Optims riding Grimlock, with one looking like Optimus with a lance, and the other looking like he is carrying a flag. 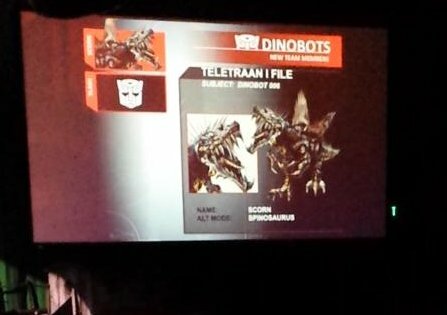 Scorn and Slash - they wanted a velociraptor in there somewhere. 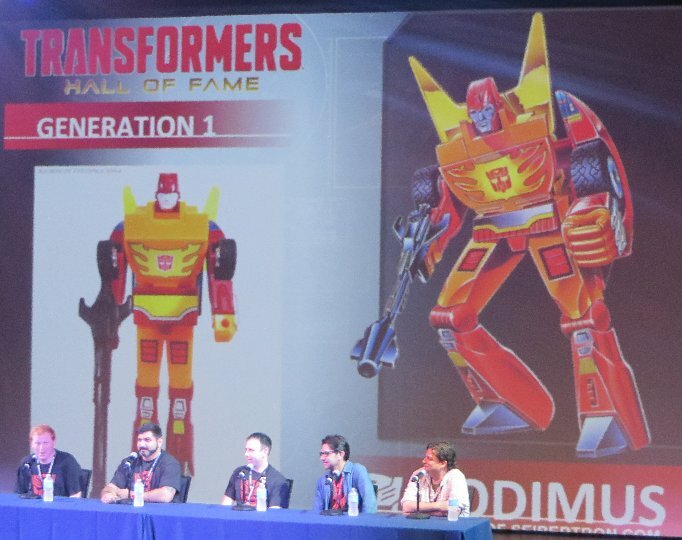 They also talked about the cross-demographic use of the Dinobots in their toy products this year, from the young ones with the gimmick toys, to the older ones with the "Generations" line and Construct-Bots.... plus made special attention to their most expensive single figure so far for the Movie - Stomp & Chomp Grimlock. 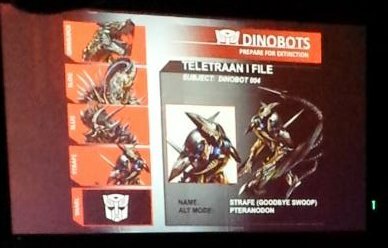 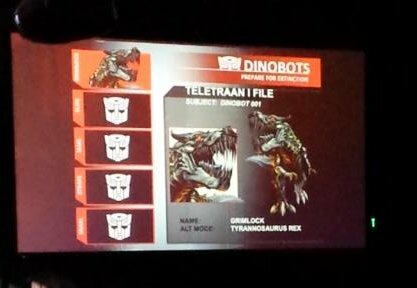 Bill (Designer) - Deluxe Dinobots (so that the toys were easy to recolour them into their Gen1 colours). 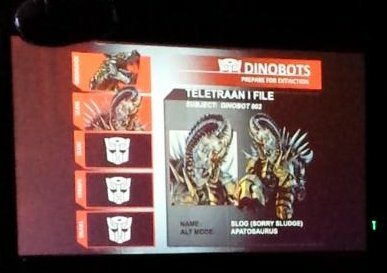 John W (Designer) - Voyager Slog (Sludge) and Stomp & Chomp Grimlock. 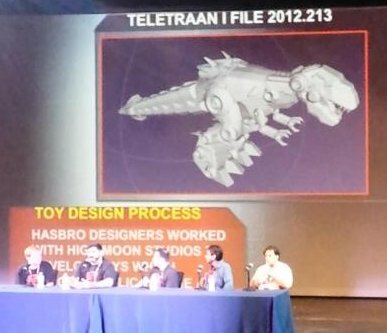 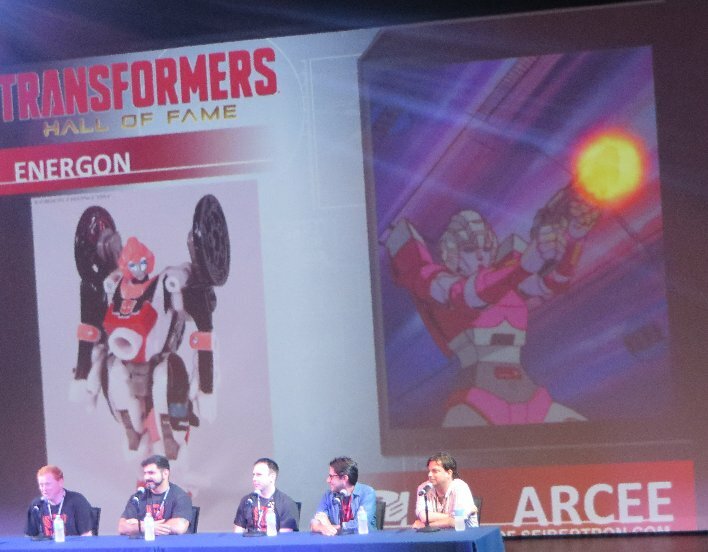 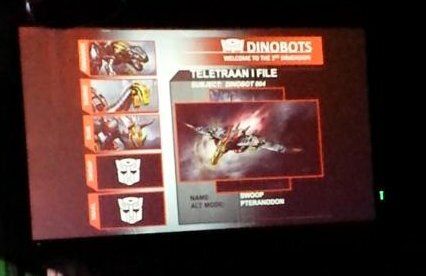 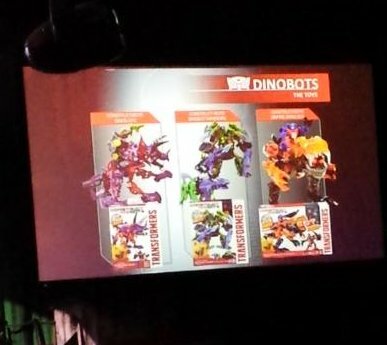 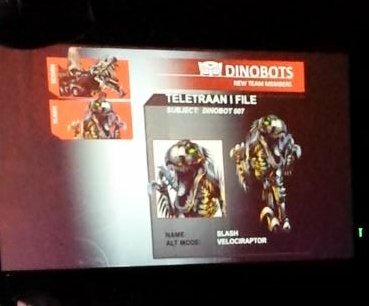 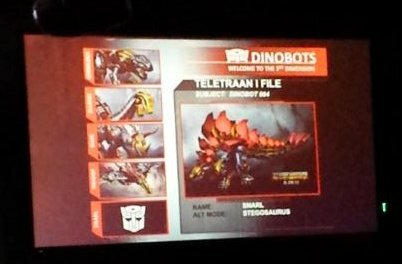 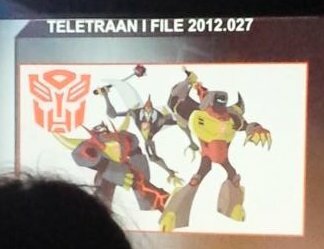 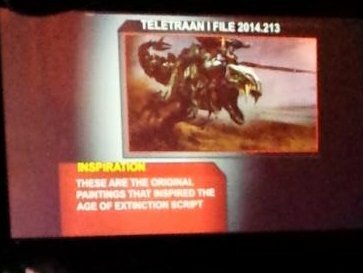 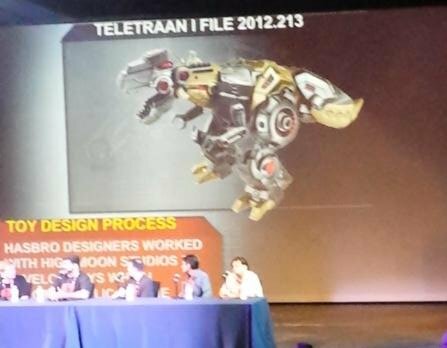 9.47pm - they finished up the presentation by screening the animation shorts of "How to Train your Dinobot" that Hasbro posted on Youtube a couple weeks ago. 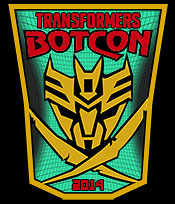 At 10pm Stan Bush started performing on stage, with some songs from his new CD, and his famous Transformers songs. 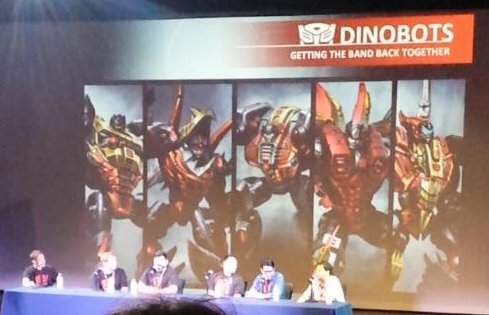 He didn't sound as good as he usually does, so maybe his voice is getting too old to belt out his songs the way they used to sound. 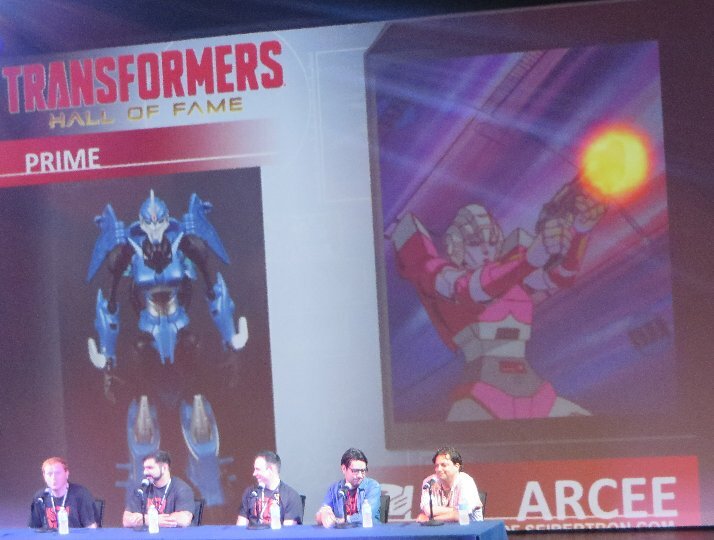 Someone else has posted up a video of one of his songs and some photos. 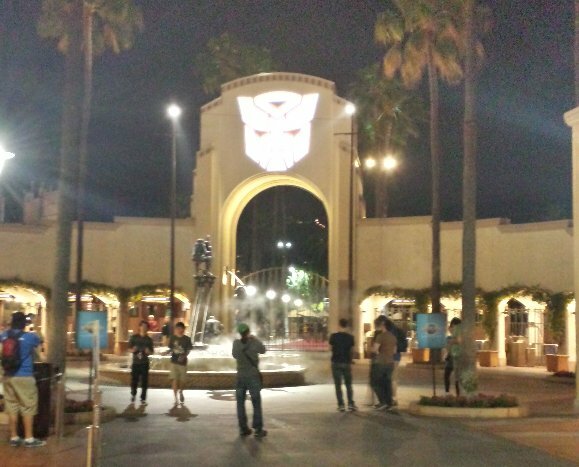 About 7 or 8 songs later, he was done, as it had to finish within an hour, before 11pm, for people to get to the buses back to Pasadena. 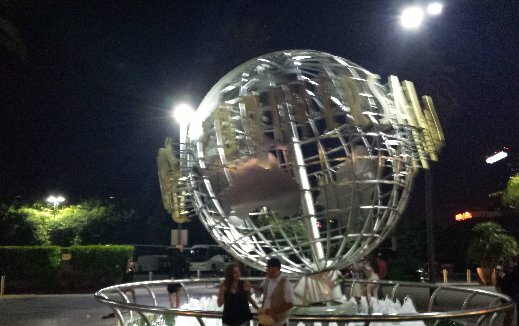 And the Universal globe with the Australian side showing. 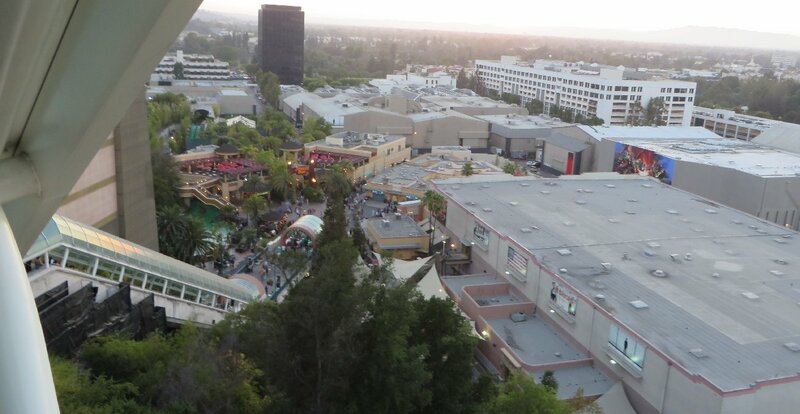 The bus back to the Pasadena Convention Centre was about 35 minutes.